It has been more than five years since the United Kingdom’s Ministry of Defense shuttered its Harrier fleet, eventually selling it to the U.S. for a song. 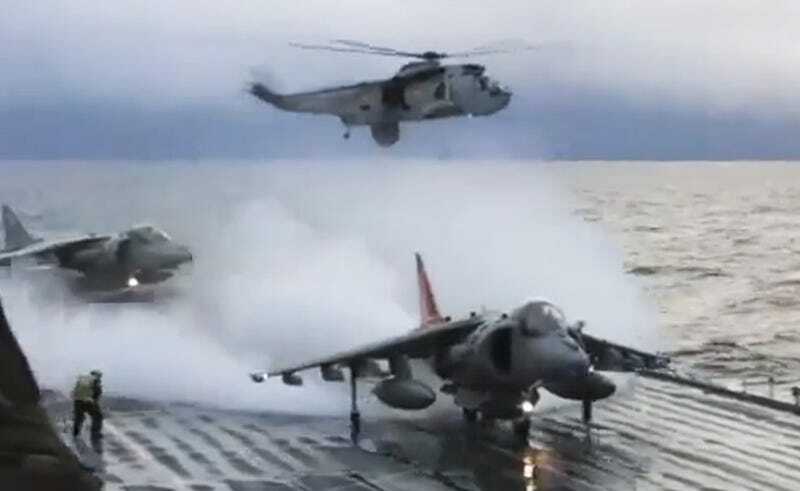 Here’s a throwback video from Nov. 24, 2010 of the Harriers executing their final launch from the very rain-soaked deck of the HMS Ark Royal. Oh and wait for the end, there is a little high-speed surprise you won’t want to miss. Cutting the UK’s Harrier force, which had decades of life left in it and had recently seen key upgrades, was a short-sighted move. The Pentagon got the 74 Harriers for a paltry $177 million dollars. This is less than $2.5 million dollars per jet, or about the price of one F-35B, give or take a few tens of millions of dollars depending on how you calculate it. Today these airframes are being used as attrition reserves and spare parts hulks for the Marines’ AV-8B fleet. You can see them here, although there are some at MCAS Cherry Point as well (you may want to get your tissue ready, it is a sad sight). Now the UK is heading back in the fixed-wing capable carrier business in a big way with their two Queen Elizabeth class aircraft carriers. The only problem is that these carriers, which are much larger than their predecessors, need aircraft. Since the decision was made not to go with a catapult and barrier setup, where they could fly anything from a Super Hornet to a Rafale off the ships’ decks, they are stuck with only one aircraft choice, the hugely expensive but potentially very capable F-35B. This year’s much publicized Strategic Defense and Security Review (SDSR), which put a premium on developing air power, has stated that the RAF and Royal Navy will share a fleet of 42 F-35Bs by 2023. This was necessary so that the Royal Navy had at least some fighter aircraft to fly off the deck of the HMS Queen Elizabeth. Under the scheme 24 will be used for the carriers and 18 will be used for training. Still, the HMS Queen Elizabeth may embark Marine F-35Bs before Royal Navy models. The SDSR also said the MoD will pursue 138 F-35Bs in total, a much larger number than many thought they would be willing to buy. This is all fine and good, but if the MoD just kept its Harriers, it could have aircraft ready to fly off the HMS Queen Elizabeth once she becomes fully operational in 2020. Not only that, the Harrier is smaller, much less complex, comparatively inexpensive to operate and would have been a great complement to the F-35B once it arrives in strength. Not divesting the entire Harrier fleet would have also allowed for a slower acquisition of F-35Bs, which would have freed up funds for the MoD to invest in its surface fleet, other priorities. Even fully crewing both carriers remains a unresolved budgetary issue, although the MoD says they plan on doing so. The 138 F-35B procurement number also includes aircraft that will replace the hard-working and aging Tornado GR4 fleet. But for many missions, an F-35B simply isn’t necessary. A split fleet, at least as the RAF and RN spins-up its F-35B force through the next decade, would have been a good value and capability mix. It would also make the hope of fully fielding two fully operational, fully outfitted aircraft carriers a more attainable reality. In the end, the U.S. got the best of UK’s once proud and decorated Harrier force, but at least we have videos like the one above to remember it by.